It has a sharp edge and super thin, flexible build that was developed for using with delicate fish fillets. Designed to allow cooks to effortlessly flip delicate fillets of fish, it's actually good for so much more. Whether on a sheet pan or in a skillet, its razor-thin, angled edge allows you to flip anything without disrupting or dislodging the golden brown crust you worked hard to archive. 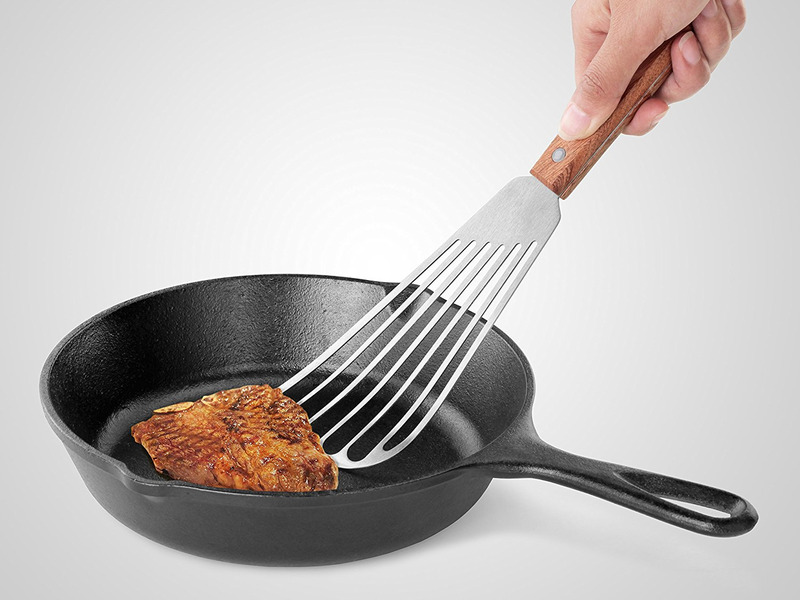 Slats in the steel allow grease and oil to drip through when you're using it to lift shallow-fried foods, and a flexible build allows you to maneuver easily and get proper leverage even in a crowded pan. I use mine for everything from transferring freshly baked cookies onto a plate to flipping fried potato latkes in a bubbling hot cast iron skillet. I also use it to scrape down all the brown bits left behind from cooking veggies and proteins so I can make the most of my sauces, and it has even come in handy when cleaning dishes with caked-on ingredients.